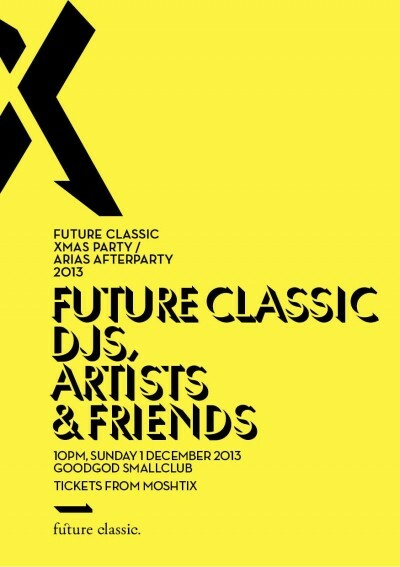 Australia via the universe tastemakers and trendsetters Future Classic are throwing a HUGGEEE Xmas party across the whole venue to say thank you for all the support this last year. For anyone familiar with the success and calibre of their roster this will be without a doubt one of the largest parties of the year. Future Classic keep punters guessing with a Mystery bill including the extended Future Classic Fam & Friends spread across the Danceteria and the Front room. Expect Intimate all night live performances and DJ’s running tunes to the early hours of your monday morning. Proceedings kick off at 10pm and will also serve as a post-ARIAs kick on. Tickets are only ten bones plus booking fee and if you sleep on this and miss out you will be more than likely crying yourself to sleep on Sunday night.